We’re always in search of the hottest skincare on the market and our newest obsession? Supernatural Body. 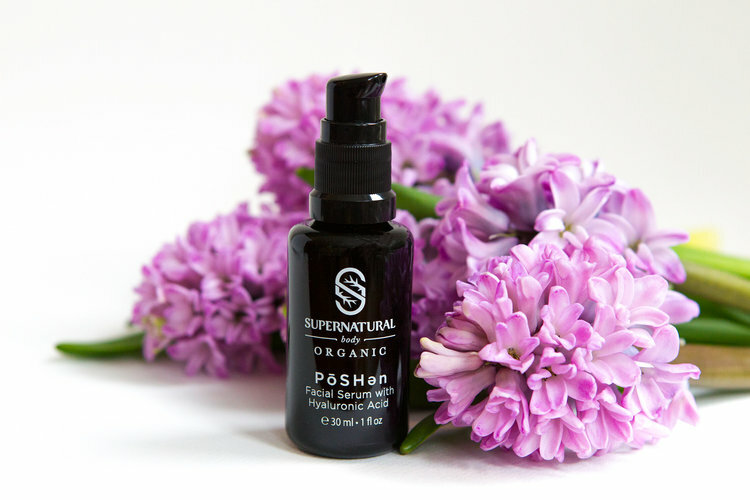 Supernatural Body has searched out the best organic ingredients Mother Nature has to offer and carefully blended them to craft products that not only give you beautiful skin, but also help to preserve the planet, pretty cool, right? Their mission was to create luxurious organic beauty products. Supernatural Body believes that the secret to making the best skincare products is simple – you just need to use the very best ingredients. That’s why they made it their mission to use only ingredients that would earn their products the gold standard of labeling claims: USDA-Certified Organic. Aloe Vera : Hydrates, calms, moisturizes, softens accelerates skin healing. Amla Extract : Antioxidant, protects the skin from sun damage and helps reduce hyper-pigmentation. Argan Oil: Boosts cell production and improves elasticity. Camelia Seed Oil : Contains anti-oxidants that help to revitalize, hydrate and rejuvenate the skin. Chamomile: Anti-inflammatory, soothing and healing, calms sensitive skin. Coconut Oil :Antioxidant, strengthens skin tissue while absorbing quickly into your skin. Flax Seed Oil :Excellent for rosacea, acne, dermatitis, eczema, or psoriasis. Helps reduce inflammation while balancing the skins oil production. Gotu Kola :Strengthens collagen production and improves skin elasticity. Grape Seed Oil :Non-comedogenic. It is known to tighten skin, diminish dark circles around the eye area, moisturize, increase elasticity, treat acne. Jojoba :Anti-inflammatory. Treats dark spots, acne, balances oil production and moisturizes. Kelp :Excellent hydration as well as anti-inflammatory and anti-aging benefits. Matcha Green Tea :Anti-inflammatory. A powerful antioxidant to help improve skin tone, firmness and elasticity. Moringa :High in vitamins and unsaturated fatty acids. Helps to firm skin, minimize dark spots prevent wrinkles, slow premature aging. Rosehip: High amounts of Vitamin A, C and E help repair sun damage and reduce hyper-pigmentation over time. Restores collagen and firmness. Sancha Inchi Oil : Helps balance acne prone skin and protects sun damaged skin. High in antioxidants and Vitamin E. Provides superb anti-aging benefits, helps maintain skin’s elasticity. Sea Buckthorn Oil : Incredibly rich in antioxidants and essential fatty acids, promotes healing, and moisturize. Sunflower : Extremely high in linoleic acid which helps in skin rejuvenation and helps retain moisture. This Facial Serum is a wonderful daily moisturizer suitable for all skin types. Crafted with organic oils of Sacha Inchi, Sea Buckthorn and Flax Seed it combines nourishing fatty acids and powerful anti- oxidants to help fight the signs of aging. This powerful serum is further enhanced with Hyaluronic Acid that helps deliver moisture deeper into the skin contributing to a supple and younger looking complexion. This luxurious Cream Cleanser removes makeup, cleanses and softens skin all at once. All skin types will benefit from the carefully balanced formula made from organic ingredients rich in antioxidants and Vitamin C derived from the extracts of Matcha, Moringa and Triphala. The cleanser is enriched with a blend of pure organic oils: camellia, sunflower, and rosehip which are packed with nourishing omegas to preserve a youthful glowing complexion. This wonderfully restorative eye gel is specifically designed to revive, firm, and hydrate the delicate area around the eye. This gel has been supercharged with Moringa and Triphala to boost the concentration of key vitamins and antioxidants known for their ability to help retain skin moisture while minimizing fine lines and wrinkles. These incredible organic active ingredients are carefully blended with organic Camellia Seed oil to deliver increased tone and smoothness. Glo Body oil is a luxurious moisturizing oil rich in Vitamin C and anti-oxidants that is absorbed quickly leaving skin silky smooth and suitable for all skin types. The body oil is a rich fusion of exotic organic oils of Sacha Inchi, Sea Buckthorn, Grape Seed, Camellia and Jojoba to create a unique skin care product loaded with nourishing fatty acids which promote healing, rejuvenation and protection against the elements. Glō with Lemongrass has a fresh, crisp fragrance with floral and woody notes.